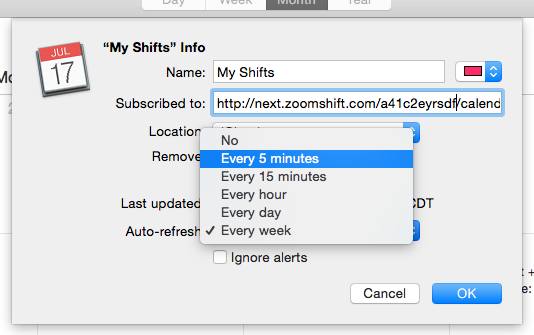 With ZoomShift, you can subscribe to shifts, so they appear on your Google or Apple calendars. This is handy if you want to see your work schedule alongside your personal calendar. 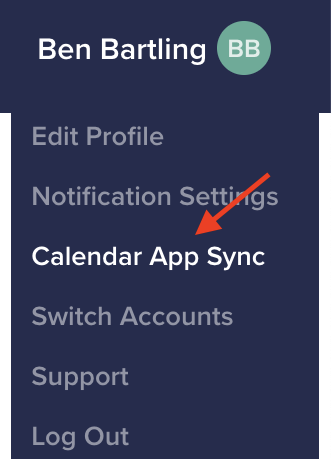 To get started syncing your calendar with ZoomShift, click on your initials in the top right corner and select Calendar App Sync. You should see a list of the organizations you belong to. Click on the organization and you will see a pop-out like the one below. Copy the link of the shifts that you would like to subscribe to. You will need to paste this link into Google Calendar or iCal later on. Login to your Google Calendar by going to https://www.google.com/calendar. Once logged in, click on the plus icon in the left sidebar and select the From URL option. You will then see a form like the one below. Enter the link that you copied from above into the text field and click the Add Calendar button. In a few seconds, you will see your shifts show up on your calendar! When new shifts are published on ZoomShift they will not immediately show up on your Google calendar. In fact, it could take anywhere from 15 minutes to 24 hours for your shifts to show up. Google does not have a set schedule for refetching shifts. Unfortunately, we can’t do anything about this :). Open up your iCal app and go to File -> New Calendar Subscription. You will then see a pop-up like the one below. Enter the link that you copied from above into the text field and click the Subscribe button. In a few seconds, you will see your shifts show up on your calendar! On the next screen, you can set up the name and color of your calendar. You can also set how often your shifts will be refreshed. Make sure you change this option to every 5 minutes so that your calendar gets updated as quickly as possible. Why aren’t my shifts showing up? Your shifts may not be showing up for many reasons, but the most common reason is that your shifts have not been published in ZoomShift yet. Only published shifts will show up on your calendar. Also, it can take Google Calendar awhile (15 minutes to 24 hours) to recognize new shifts that have been added. 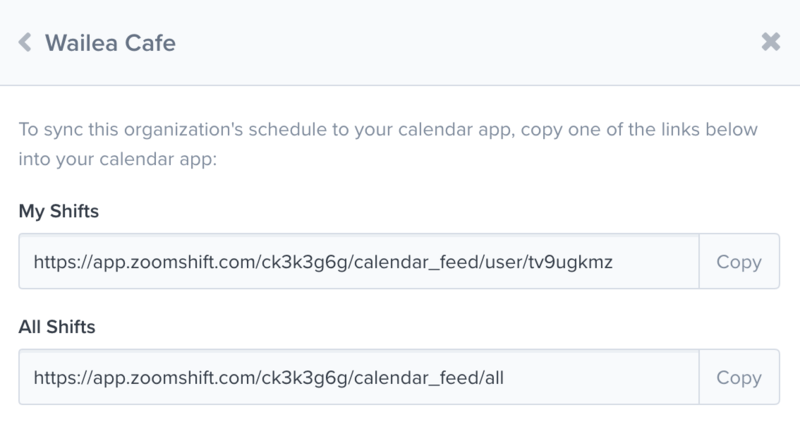 Be patient when you add new shifts to ZoomShift as they won’t show up immediately on your calendar. Why is the time of my shifts not showing up correctly? If your shifts are showing the wrong start and end time it is most likely that your time zone settings are incorrect. For the correct times to show up, you need to have the same time zone settings on your Google or iCal calendar as you do in ZoomShift. You can adjust the time zone settings from Settings -> General. Why can’t I edit my shifts on my calendar? It just doesn’t work this way :). You are only allowed to view your shifts on your calendar, and you can’t edit them. All changes need to be made through ZoomShift. How far into the future will shifts show up on my calendar? The calendar feed will show shifts that are within one year from today. And they will show up to 100 shifts. If you have published shifts in ZoomShift outside of this range, they will not show up on your calendar.